It really shows when a builder knows their subject, and that is absolutely the case here! 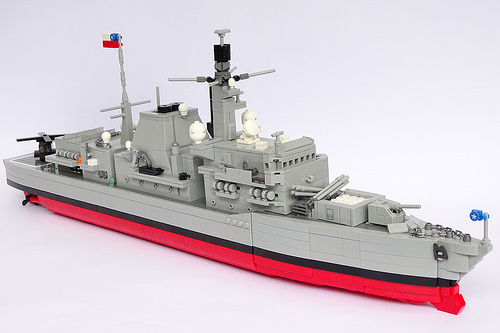 According to Luis Peña his 1:200 scale LEGO model of a Type 23 frigate in Chilean Navy service was built with the aim of reproducing as many of its details and equipment as possible. 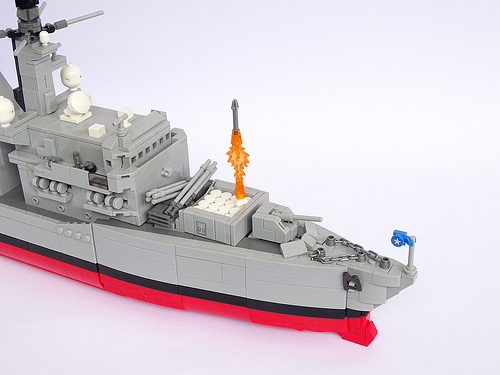 Every aspect of the build, form the various surveillance and control radar to the ship’s 4.5 inch Mark 8 naval gun is a miniature replica of its real world counterpart. My personal favourite features, though, have to be the microscale Cougar SH32 helicopter perched on its landing pad, and the Sea Wolf anti-air missiles’ vertical launching system, which Luis has built in epic mid-launch. Great ships, having served on one I know I believe this was HMS Norfolk F230 before being sold to the Chilean Navy.